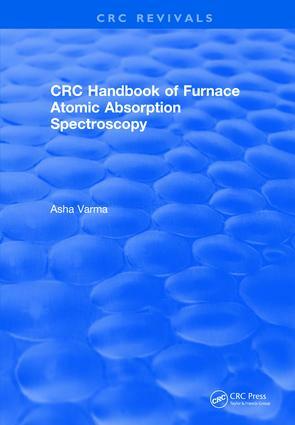 This book addresses Furnace Atomic Absorption Spectroscopy (FAAS), which has gained worldwide acceptance as an analytical technique. FAAS offers 100-1000 times better determination and detection limits than other techniques for a majority of the elements. This technique requires a small sample size, and demands less sample-preparation time than others. The handbook is a collection of thousands of references for detection and determination of various elements in agricultural products, biological and clinical samples, and metallurgical and electronic materials. Each chapter is devoted to an element or a similar group of elements. Included are instrumental setup parameters, references, and author and subject indexes. Also presented are detailed appendixes covering glossary, list of manufacturers of spectrophotometers and its accessories, list of chemical suppliers, and list of reviews and abstracts. The handbook covers topics such as heavy metals, clinical products, and trace metal analysis. This desk-top reference is meant for chemists who handle day-to-day analysis problems in laboratories in government, clinical, industrial and academic settings. It is invaluable for those involved in research in environmental science, analytical chemistry, clinical chemistry and forensic science.